Hello and welcome to exampundit. Here is a set of Reasoning Quiz based on Puzzle for Mains Examination. 8 people A,B,C,D,E,F,G,H work in 8 different companies: SBI, RBI, PNB, Infosys, Wipro, TCS, Amazon, HP. They live in a same 6 storey building – Ground Floor,1st floor,2nd floor,3rd floor,4th floor,5th floor. 2 floors are vacant and there are two flats on each floor. Neither A works in SBI nor E works in TCS. TCS never shares his floor with Wipro or Infosys. G neither works in SBI nor in RBI. B lives with the person who works in TCS on an odd numbered floor. D works in PNB but neither lives with the person who works in Wipro nor Amazon. A lives immediately above one of the vacant floors. B,C and C,A have one floor gap in between them. Wipro lives on the topmost floor with A. None lives on Ground Floor. G and F live together on an even numbered floor. The person who works in PNB stays with the person who works in HP. The person who works in TCS neither stays with the person who works in RBI nor SBI. Option: D – All are Diagonally connected except, E & B. Refer the main solution. Which floor is vacant other than the ground floor? Who live in between E and D? Eight persons sit in a row not necessarily in the same order. They are Prithhika, Ketan, Riya, Sumedha, Tia, Umar, Vani, and Amar. 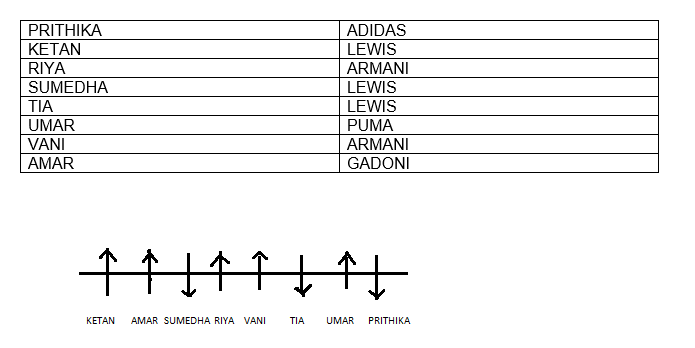 They like different brands-Armani, Gadoni, Puma, Lewis, and Adidas. Not more than two people like the same brand and atleast one person likes the given direction. Some of them face the north direction while some of them face the south direction. People who like same brands face in opposite direction from each other and they don’t sit together except people who like Armani. Sumedha and Tia don’t sit at extreme ends of the row and have two people in between. The person to the immediate right of one of the persons who likes Armani likes Gadoni and also faces south. Ketan is third to the left of Riya, who faces North direction and does not sit at any end. Tia who does not like Armani is second to the right of one who likes Adidas. Prithika sits three places away from Vani and they do not sit with Ketan. Neither Riya nor the persons sitting with Riya like Gadoni. How many people face north direction? Who among the following likes Armani? Who among the following sits at the ends? Which brand is liked by the one sitting fourth to the left of Sumedha? How many persons are sitting between the persons who like Gadoni?